General Hospital (GH) spoilers for Monday, April 16, tease that Ava (Maura West) will still have those test results on her mind. Griffin (Matt Cohen) assured Ava that he’d tell her what was up if he could. He doesn’t want to break doctor-patient confidentiality, so he’s choosing to stay tight-lipped. Of course, that won’t stop Ava from mulling over the mystery. She’ll be determined to crack the case, so we’ll see if she makes any progress. At GH, Griffin (Matt Cohen) and Finn (Michael Easton) will discuss Anna (Finola Hughes). General Hospital spoilers say Griffin will just want to check in and see if Anna’s doing all right. He’ll suggest that this Heinrik stuff has him worried. Finn might note that Anna isn’t really giving him updates on anything. They’re growing further and further apart thanks to his romance with Alexis (Nancy Lee Grahn). However, GH buzz suggests that there’s still hope for “Fanna” down the road. Anna just needs to get this Heinrk mayhem wrapped up before she does anything else. In Switzerland, Robert (Tristan Rogers) will try to figure out why Anna’s (Finola Hughes) so invested in this mission. He’ll think it’s dangerous and he won’t understand why Anna’s working with Jason (Steve Burton). Furthermore, Robert won’t be pleased that their granddaughter’s been dragged into it. Anna will defend it as a research trip for Emma (Brooklyn Rae Silzer) and insist that she’d never put her in harm’s way. As for Heinrik, Anna will feel partially responsible for the trouble he’s endured. She’ll suggest that she should’ve paid closer attention and found out about Heinrik’s existence. Naturally, Robert will wonder if there’s something Anna’s leaving out. He’ll be determined to get to the bottom of all this. Elsewhere, Sam (Kelly Monaco) will tell Jason how she ended up in Switzerland. He’ll also share some details about the Heinrik mission, including the fact that this guy left hints for his mom. Jason will feel like Heinrik’s targeting his mother with the goal of meeting her. Back in Port Charles, Carly (Laura Wright) will get spooked once again. She’ll follow the note’s orders, so it appears she’ll find herself at the site of the explosion. Nelle (Chloe Lanier) will cook up another part of her scheme across town, so Carly should brace for more Morgan (Bryan Craig) chaos. 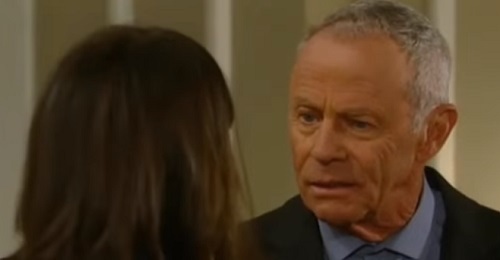 Other General Hospital spoilers say Sonny (Maurice Benard) will hit the roof when he realizes Mike (Max Gail) took off with Avery (Ava and Grace Scarola). He’ll rip into the nanny for taking her eyes off them, but what’s done is done. Sonny will have to dial down his rage and focus on getting his loved ones back ASAP. It sounds like things are heating up in on the ABC soap. We’ll keep you posted as other news comes in. Stay tuned to GH and don’t forget to check CDL often for the latest General Hospital spoilers, updates and news.